Anger is not essentially a bad thing. It’s a completely natural emotion that everyone feels from time to time. Occasional anger can sometimes be healthy. It helps to express your feelings, deal with situations, and move you into action. Anger becomes a problem when it escalates too often and tends to get out of control. An anger problem can have a negative impact on all aspects of your life. It can have damaging effects on your relationships, family life, your job, and your health. 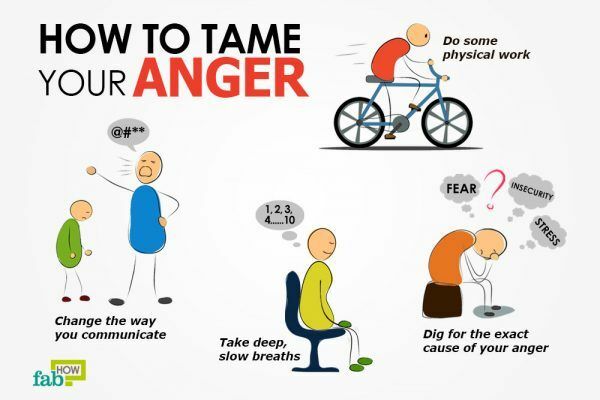 Fortunately, many strategies can help you deal with your anger. If you have a hot-headed temperament, you won’t snap your fingers and instantly become calm and laid-back. But these easy-to-follow tips can help you control your anger and prevent it from damaging your life. 3. Timing is important. Do you tend to fight with your spouse or yell at your kids at night? Perhaps you are tired and frustrated after a long day’s work. Avoid discussing important matters at night to prevent the discussion from turning into arguments. 5. 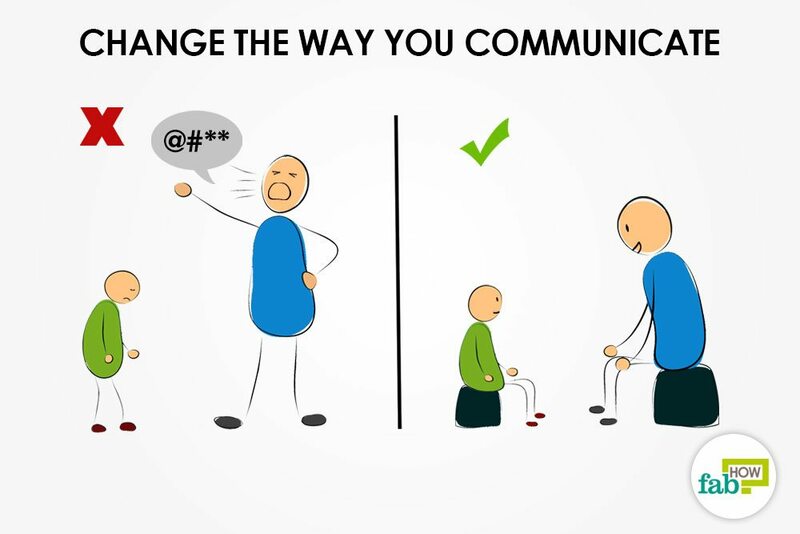 Change the way you communicate. Words spoken in anger often become a source of regret. Most of the time it’s not what you say that causes arguments, it’s how you say it. Rather than being aggressive, critical or rude, try to communicate in a respectful manner. 6. Don’t jump to conclusions. 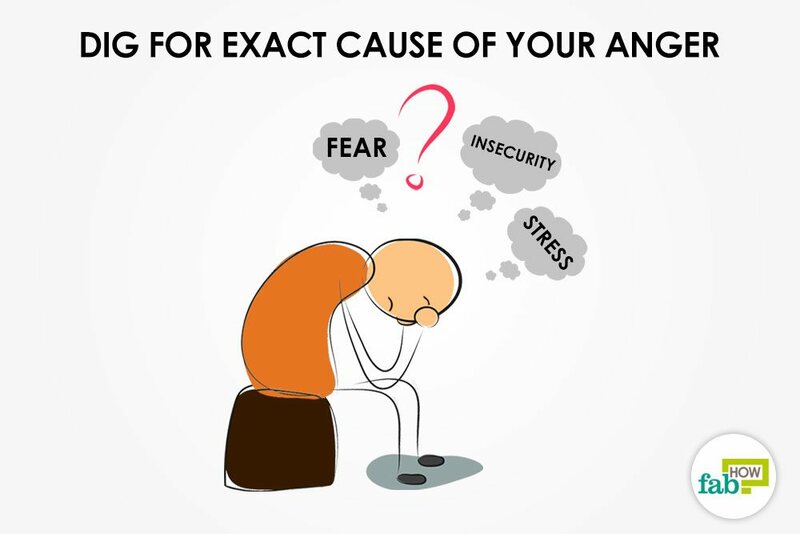 Analyze your thoughts; you may find yourself getting angry due to assumptions that are not necessarily true. Things may not be as they seem. Making assumptions on the basis of past experiences can also be one of the reasons behind your anger. Consider all alternatives before jumping to conclusions and getting angry. 8. 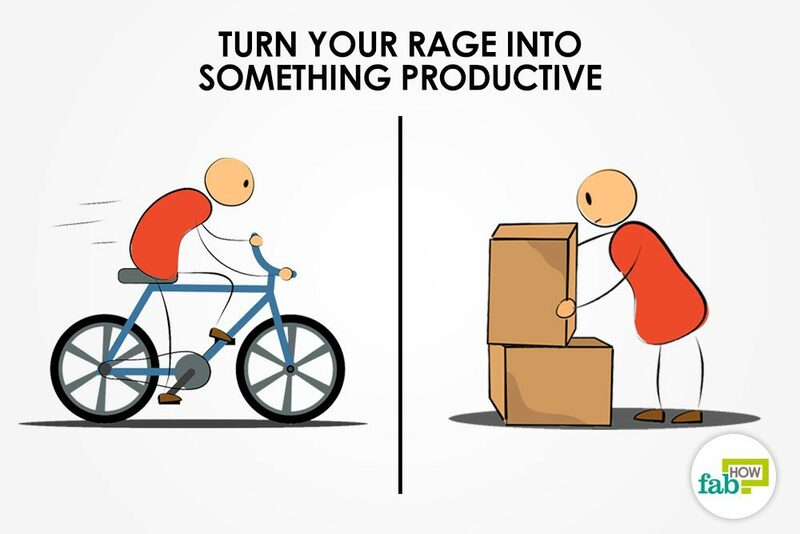 Turn your rage into something productive. When you are seething with anger, turn your anger into motivation. Divert your attention to something else. Doing any kind of physical work will help you burn off the anger. Do something that requires physical energy like moving old boxes to some other room, cleaning your closet, etc. Exercise 9. Exercise can help clear your mind and calm you down. The next time you find yourself angry, go for a run or hit the gym. If you are at work, even a brisk walk can help. The exercise doesn’t need to be lengthy and strenuous. Any form of physical activity releases mood-boosting chemicals called endorphins that relieve stress and create feelings of happiness and well-being. 10. Meditation helps calm both your mind and body. The next time you feel irritated, go to a quiet room and meditate for a few minutes. Sit in a comfortable position in a peaceful environment. Close your eyes and focus on your breathing. If you find your mind wandering, bring it back to your breathing. This will help you to feel more calm, able to analyze the situation, and perhaps lead you to a resolution of the issue. 11. Imagine something positive. Visualize a relaxing and calming experience from your past; or transport yourself through imagination to a place that instantly lifts your mood. 12. Listen to music. Listening to music is one of the easiest and most effective ways to improve your mood. You may have noticed when you listen to an upbeat song, it instantly lifts your mood. Research suggests that extreme music genres like heavy metal, emo, punk and scream can help calm angry listeners. (4) No matter which genres you prefer, music can be a therapeutic outlet for anger. 13. Get creative. 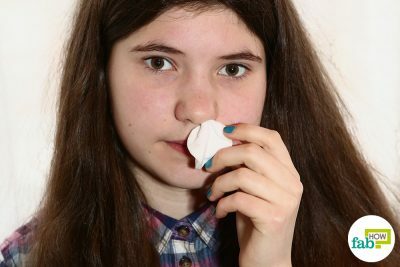 For some, being creative helps calm their senses. A creative outlet for your anger will help you deal with it. Channel your emotions in a productive way – be it arts and crafts, painting, literature, dance, cooking, gardening or any activity that makes you happy. It gives you something to distract your mind, while directing the energy behind your anger into creating something beautiful. 14. Watch something funny. As they say, “Laughter is the best medicine.” Lightening up can help diffuse anger. Humor can even help you face what's making you angry. Try watching your favorite comedy show that makes you roll with laughter. This will help you lose yourself for a time and take your mind away from your troubles. 15. Count to 10. This is an age-old method used by many. When angry, the first thing that comes out of your mouth is usually something rude or mean. So, count to 10 before you speak. This will give you a pause and help distract you from the moment. A 10-second mental break from a negative situation will help you cool down, so you can collect your thoughts before you speak. Counting slowly will help, as it will give your blood pressure and heart rate some time to return to normal. 16. If necessary, walk away. 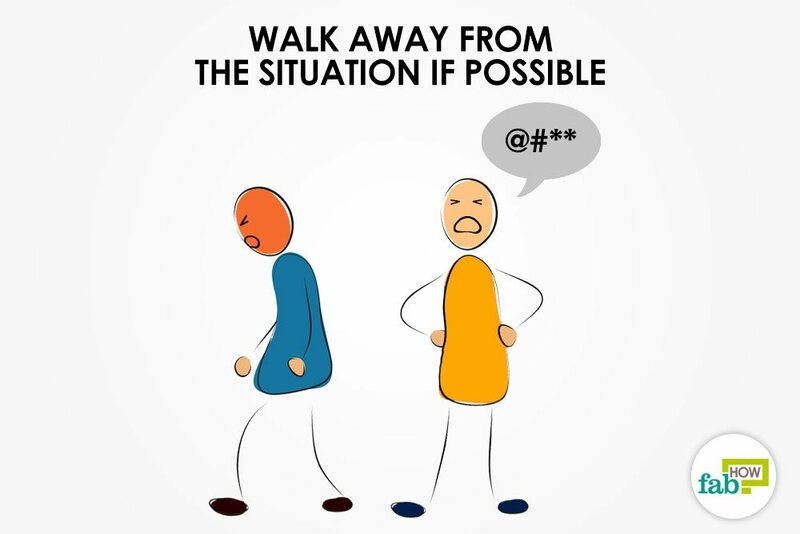 Walk away from the situation if possible. This will help you calm down. Being away from your source of anger will give you time and space to think about it. If you are at a place where it’s difficult to walk away, find a reason to excuse yourself. If needed, tell them you are not in the right frame of mind to talk and that you will be back in 10 minutes to discuss the matter. Staying in a conversation when you have trouble controlling your anger can lead to saying things you will regret later. 17. Discuss issues when you are calm. 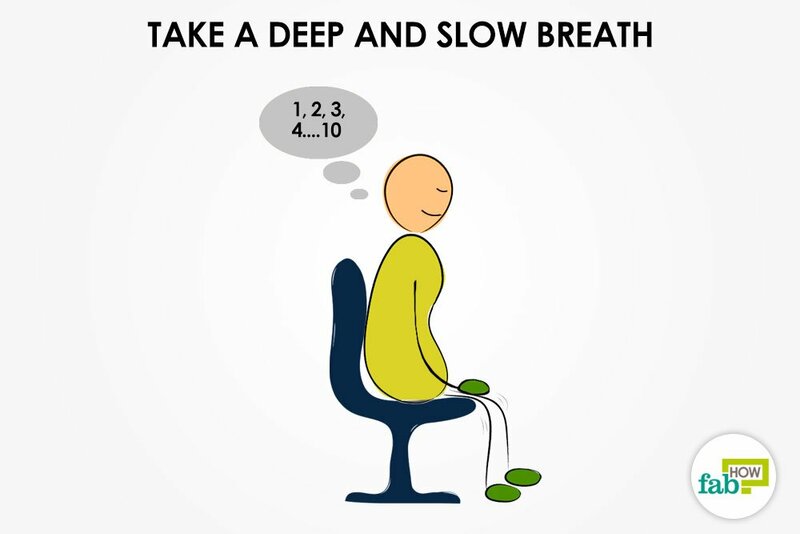 Before beginning a difficult conversation, take a few moments to calm yourself. The best time to have a conversation with someone you are angry at is when you are calm. 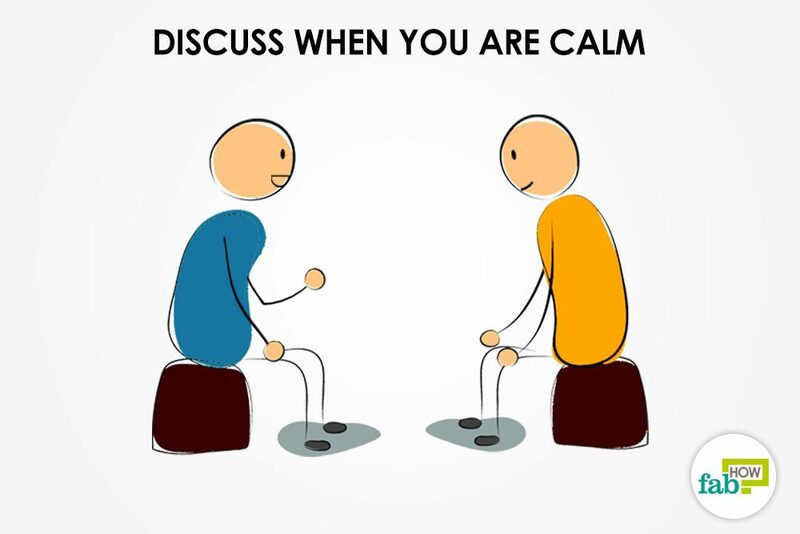 Once you are calm, discuss the real problem and have a constructive dialogue. 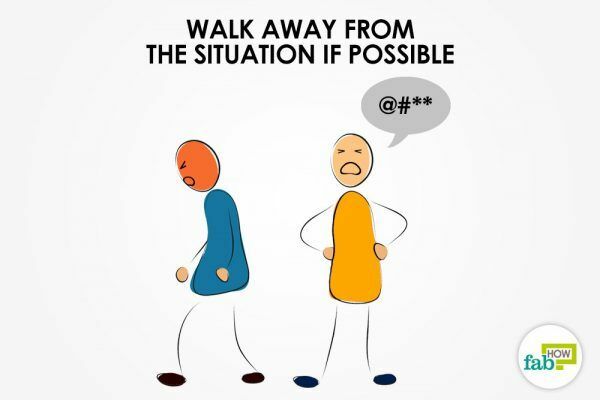 But make sure to do this in a non-confrontational way. Express your feelings and address the problem in a respectful manner. Avoid blaming the person, which could start another argument. 19. Take some time off. Schedule some personal time, even during the day. Take a break for 10 minutes when you get home. This time should be your personal time. Make the most of this quiet time. It will help you handle the temper tantrums and demands from your kids without losing your temper. 20. Talk to someone. Sometimes talking to someone about your issue can work wonders. Be it your close confidant, colleague, or anyone you trust, talking about your problems can release pent-up feelings. Talking to someone also can help you look at the problem through another A new and different look at the issue may even help you find a solution. Knowing there is someone to talk to and support can make a big difference. 21. Surround yourself with positive people. If you have any negative relationships in your life, remove them. Make an effort to connect with more optimistic, encouraging and positive people. 23. Imagine yourself angry and see how it looks. Looking at situations from outside of yourself can help you find solutions. It’s easy to lose sight of things and some situations may leave you feeling as if there is nothing else to do except get angry. Take a moment to imagine how you look when you are angry. When you are about to shout at someone, imagine how you would look. It may make you feel a little foolish and can snap you out of your anger. Doing this can give you another perspective on the situation. 24. Drink a cup of tea. A cup of tea can help you control your anger. The L-theanine found in green tea helps soothe and calm your brain. Theanine alters levels of neurotransmitters like serotonin and dopamine in the brain, that have a positive effect on mood. Other herbal teas that relieve stress include lavender, lemon balm, orange, chamomile, spearmint, peppermint, mullein, and sage. Grab a cup of tea when you’re angry to help improve your mood and feel better. Lochman JE, Palardy NR, McElroy HK, Phillips N, Holmes KJ. Anger management interventions. Journal of Early and Intensive Behavior Intervention. http://psycnet.apa.org/journals/eib/1/1/47/. Published 2004. Pashupati M, Dev SV. Anger and it's management. Journal of Nobel Medical College. https://www.nepjol.info/index.php/JoNMC/article/view/7282. Published 2011. Renati R, Cavioni V, Zanetti MA. ‘Miss, I got mad today!’ The Anger Diary, a tool to ... Th International Journal of Emotional Education. http://www.academia.edu/2286160. Published April 2011. Sharman, Leah, Dingle, A. G. Extreme Metal Music and Anger Processing. Frontiers in Human Neuroscience. https://www.frontiersin.org/articles/10.3389/fnhum.2015.00272/full. Published April 27, 2015.